When you go around malls, chances are you’ve seen one of the Papemelroti stores. This brand has been around for decades, and this store has touched the hearts of many Filipinos at one point in their lives. A peek inside will show hundreds of items, arts and crafts packed into a small space, from figurines to hand-painted t-shirts, from posters to coffee mugs, from wooden signs bearing Bible verses to scrap books and craft paper. It is a gift store with hand-fashioned items that are both endearing and unique, but Papemelroti has an interesting story behind its enduring success as a business venture, a family business. We spoke with Patsy Paterno, one of five siblings from the Alejandro family who owns the business. The name itself is derived from the first names of the five siblings, and in order of seniority—Patsy, Peggy, Meldy, Robbie and Tina. Their parents started the predecessor of Papemelroti—their first store was Corben (for Corit and Benny, their parents) put up in 1967 as a concession to the matriarch, Patsy’s mom. Back then, Corit was already doing stuffed toys by hand which Benny would bring to his office to sell. Corit wanted so much a small store for herself, prompting the family to hunt down a two story place that had a store on the ground floor, and a good living space for the family of seven on the upper floor. The store had a display window that Corit would dress up with her own creations, but customers who went inside the store were surprised to find that the only items that were for sale were those in the display window!! What is amazing about the Alejandros is their sense of family. The parents encouraged the children to have activities that centered on arts and crafts, making figurines and decoupage together, and as Patsy was growing up, she remembers giving expression to her artistic talents and creating something, anything that could be worth selling in their tiny gift store. This was also true for her four other siblings. Soon after graduation from college, the Alejandro children thought of putting up a small gift shop which they opened in Ali Mall in Cubao, Quezon City. Back then, Ali Mall was THE mall, and it was packed with stores and restaurants. Papemelroti found a small space on the second floor with only family members, no employees, running the store daily. The family filled it up with their own brand of knick knacks. One brother hand-painted plain t-shirts, others made wooden frames with verses or special messages specific to a group, i.e., World’s Best Nurse, or Thank You Grandma, or To the Best Ninang Ever. The youngest in the brood, Tina, aged seven, was in charge of wrapping the gift items. The whole concept clicked and the family somehow filled a niche that no one had thought of before them. But Ali Mall itself got overrun by other rising new malls and soon, the tenants started closing down, leaving only Papemelroti standing. They relocated to the ground floor and survived well, so well in fact that the brand now has 15 stores in different places: SM branches in North EDSA, Fairview, Sta. Mesa, Las Piñas (South Mall) and Mega Mall. They also have branches in Sta. Lucia, Robinson’s Place Manila, Pampanga, Clark and, of course, their flagship store at 91 Roces Avenue in Quezon City. The family matriarch, Corit who started it all, passed away last year, but the Alejandros have remained united and steadfast. Another amazing quality of this family is their faith—they attribute the success of their business venture to God and know that whatever challenges come, they will overcome. “Most of our problems stem from the government…sad to say,” laments Patsy. They always endeavor to pay the correct taxes, Patsy says, but still get harassed in the process. Unfortunately, this is a lament that many businessmen face, so take heart: you are not alone. Aside from their numerous stores, Papemelroti sells online, so even if they do not actively export their products, these invariably reach homes abroad through their website (Papemelroti.com). Most of their stuff are local because, in Patsy’s words “they want to give livelihood to Filipinos”, though some components like those needed to make their fashion jewelry are sourced from abroad. They have also partnered with other organizations like Kidney Friends whose members make jewelry for Papemelroti. The monthly newsletter that they publish is a venue for social interaction that benefits the community as well as the loyal patrons and customers of the brand. Now, Papemelroti is thriving well, and the family is still working beautifully together. The patriarch himself has contributed his own brand of art through the metal words, a new product in the store. The store’s strength, according to Patsy is in designing—her sisters and her own son are the designers, while a niece who just recently joined in the family business does beautiful posters. The stationery and greeting cards are still there, the scrapbook, the craft paper and wood carvings as well. The personalized coffee mugs, the quaint picture frames and sweet messages on wood, the hand-painted one- of- a- kind t-shirts are still selling well. They will never run out of Bible verses to quote, or one liners from nostalgic poems or thank you messages to a favorite aunt or teacher. They now have handcrafted jewelry to add to their vast collection of saleable items, and they are still using recycled paper which they started way back in the 70s. 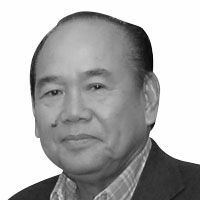 All these are part of a time-tested formula that has worked for years, “so if it ain’t broke, why fix it?” Kudos to this family business that has fared so well over almost five decades of doing business in the Philippines. May your tribe increase.